Lindsay asked me to do this a while back but i have been stalling on it. 2: I requires a few differnt tools than most of you may have - at least for my style. 3: It will take time to get through it. 4: It would have to be in stages via pics as my cam doesn't do video when I work. 5: It would be dealing with classic designs rather than the customs I do. 6: You may or may not learn anything. BUt at least you will see some different ways to employ your tools. Let me know if there is any interest in doing this. If not, then perhaps something else which is more of a universal interest, like carving a knife or something. heck, yeah ! i'll be there. juss say when ! Since I have yet to attempt coin carving, I would also be interested. I would be most pleased to veiw said tutorial. 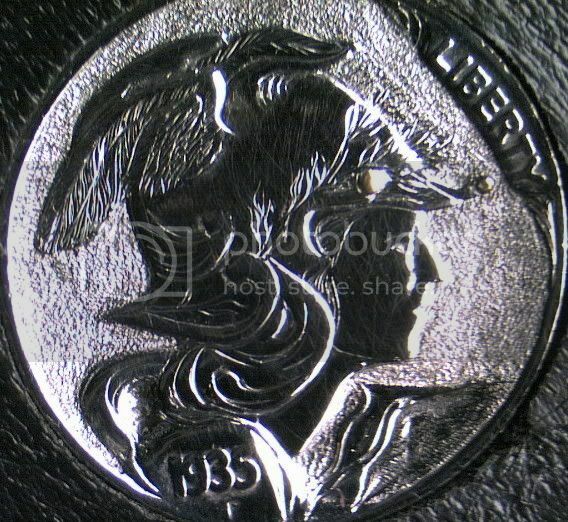 I can alway use some tips on carving coins, anything pertaining to coin carving gets my attention.. It looks like your have to go with the coin carving. I really appreciate your regular contributions on the forums, and your encouragements by direct email, so please do let us have some insights into your approach! I would also love to see how these coins are cut. They are fantastic and I have a bunch laying around to practice on. I would love to see and learn how to do it . Getting things ready for you all - now just have to wipe my linux from my laptop to get the scope cam up and working as for some reason contrary to who knows what the thing wont run on my big system with 2000. I dont think i can pull it off with the DV cam and have you see the detail. Should be up and running this week. In the meantime here are some pics to give you an idea of the type of stuff we will be playing with and the scale of the tools should become apparent. Now is the time to ask about tooling and other such stuff. I will put up some pictures of my bench layout as it works a little differently than what most of you are probably used to seeing or working with. Carving - at least the way I do it - is a dimensional art. I cut relatively deep and the quality of my work is what it is. I don't expect you to carve at the level I do. I just want you to have fun with it. Alot of the techniques will cross over to engraving and how you implement them will be up to you. Each to his own style and finding it. also looking at a thingy where we can all look at images at the same time and i can do a little white board work and mess with the imagery live. OK! Now were getting somewhere. But on the train (#1) It looks more like a person in the inset rather than a train (#3), or are my eyes deceiving me? Last edited by Steve Ellsworth; 04-22-2007 at 05:09 PM. I (almost) understand (I'm not that busy) but a pre-lim heads up would help - such as just how big (at the tip) are your gravers? We can prepare in advance but we'd just guess at sizes necessary. Are they straight tapered to the end or full sized up to about 1/2" from the end then neck down to the desired width? .....I don,t want to impose on Steve,s coin carving tutorials, but i think Steve will agree, that after most of you carve a few coins you,ll start shaping gravers, points, etc. to your own specs and shape..Steve and i both carve coins, but if you looked at the gravers, points, etc. we use, most of them would be different, yet we,re both coin carvers.. ...Coin carving to a degree has been going on for hundreds of years, but i think i would be correct in saying the way the old timers carved and the way we modern day carvers carve has been going on for 75 to 100 years..With the history of coin carving spanning the amount of years that we,ve a record of, I think it,s safe to say there will still be a demand for carved coins after Steve and I are gone..After carving coins for 11 years and unless i change my mind after this year i plan to limit my coin carving to a very few a year, so as the older coin carvers slow down there is a demand for new coin carvers.. Amost everytime the subject of carving coins comes up a new coin carver asks me,," what does carving coins pay"...It depends on how much in demand your coin carvings are to collectors , if you flood the market, don,t expect to get a very high dollar even if the carvings are nice..Also it depends on how long it takes you to carve a coin...Many coin carvers have a hard time getting a smooth field, for me getting a smooth field is really easy, but even after many years carving coins i still find that in other areas of carving i still have room to improve...[ps] My goal is to carve a coin one day that will make people say " How Did He Do It".. Thanks guys - that kind of thing is reeaallly hard to come by these days - that is, someone(s) who is really interested in sharing. For awhile there, I thought Steve L was the only one who did. True, there are classes and those who will teach for pay - but it takes somone really special to just "give". So, I want to say THANKS! I am opening this up in a new thread just to keep it less cluttered. The images are hossted on my server if you want to keep them for future reference i would suggest you download them to your drive. Feel free to ask whatever you want or help each other out as much as you want in the new thread. ok where is your server for me to look this up ? i look forward to seeing your tools for making the metal smooth after you carve. sorry couldnt do thumbnails - way too many coming. Last edited by Steve Ellsworth; 04-26-2007 at 07:40 PM. thank you Steve for the info and i know this must take hours of your time to show all of us !